While Britney Spears is The Cackling Hen's favorite for many things, such as musical artist, performer and mom (don't tell mother hen), she is neither a boy nor a band. The Hen also loves (good) boy bands, and One Direction wins this category for me and millions of tween girls around the globe. Sorry, Britney! I'm not a boy band. The 5 Eurolads are back again with a new (covered) song and video! Here's a look at the good, the bad and the ugly. The boys are giving money to charity! With all the One Direction merchandise in every store, it's hard to remember these guys are stil newbies to the show bizz world. At young ages, they're already giving some of their millions to people who have very little. It's quite admirable. Cheers, lads! All 5 guys can actually sing and we get to hear all of them both on their own and together. Niall looks like so much fun! (No, I'm not just talking about the shower scene.) Okay, they all look fun. The shimmies from Louis and Niall at 1:13. The lads who said they don't dance are ever-so gradually adding dance moves to their music videos. Sure, it's basic, but they at least look cute when they're moving awkwardly. Everyone loves a good key change! They brought their music and personalities to children of Africa. The boys seemed to brighten the day for many African children living in poverty. And those kids are in a One Direction music video, so they're famous. "Teenage kicks." I don't know what they are, but hearing the boys sing "teenage kicks all through the night" makes me feel old and uncomfortable. The dancing still has a ways to go. The production quality of this video isn't far off from all their higher-budget music videos. Someone's getting overpaid. Time to call Lady Gaga for the next video! Covering a song? I'm greedy - I want new and original material! Zayn looks like a total skeezball multiple times. After his recent alleged cheating scandal, I want him looking as wholesome as possible for the whole video. But for his first singing appearance, he's in bed shirtless looking barely awake - all too similar to the photo his alleged mistress posted to the interwebs. Poor choice boys, but I wish I looked that good crawling out of bed. What are you doing to that pole? Harry's hair at the beginning of the video in the fan. It never looks great, but what happened here? Is he wearing clips or bobby pins to hold back his hair? Those red noses. I know it's a gimmick to go along with the charity, but they just look better without them. The fact that I can't come up with much "ugly" about them. 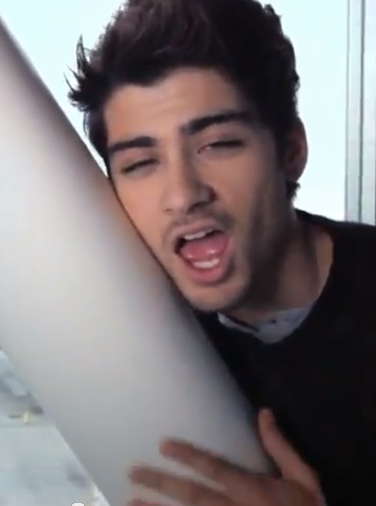 I can't even put Zayn's pole pic in the "ugly" category. Cute overload. Put down the puppies! 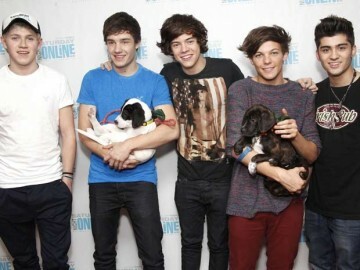 Maybe my next article will just be One Direction pictures. It will be my most read article to date. His name is Niall not Naill.